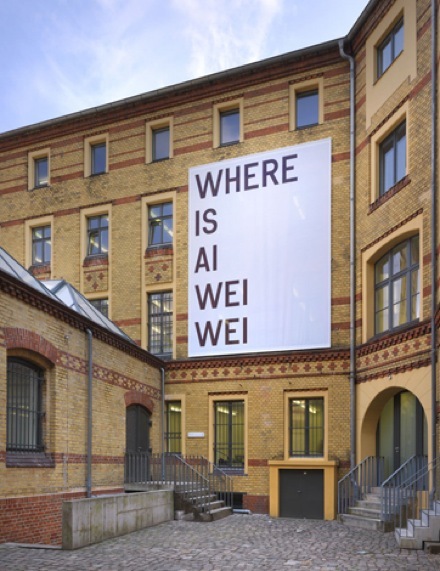 Despite his current incarceration in China, Ai Weiwei’s exhibition at Galerie Neugerriemschneider opened over Gallery Weekend Berlin, and can be seen until June 4, 2011. The exhibition consists of two large wood sculptures and several porcelain pieces. Ai designed the work specifically for the gallery site, which was produced before his arrest, and according to one source, Ai was clear in his desire that the show would go on in the event of his arrest. 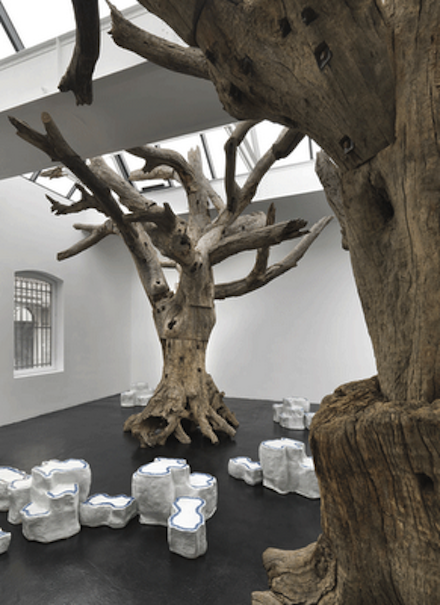 Installation view of Ai Weiwei’s Rock (2011) and Tree (2011), photo by Jens Ziehe, courtesy of Neugerriemschneider. 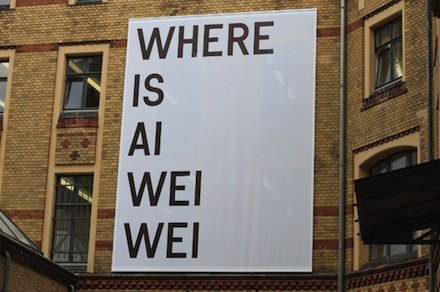 Before entering the gallery one is confronted with a huge “Where is Ai Weiwei” banner, designed by artist Rirkrit Tiravanija, hung on the building. Upon entering, the view is more airy and less political, with light looking, white sculptures encircling two old, gnarly tree sculptures that reach up to the ceiling, and in fact almost seem to poke out of the skylights. The porcelain pieces, titled “Rock” (2011), were made in the Chinese town of Jingdezhen, where porcelain pottery has been made for more than seventeen-hundred years. Installation view of Ai Weiwei’s Rock (2011), via Curated Mag. The porcelain rocks, which surround the tree sculptures, look like small, cloud-like steps, and are glazed white with a blue trim on the upper, outer perimeter. 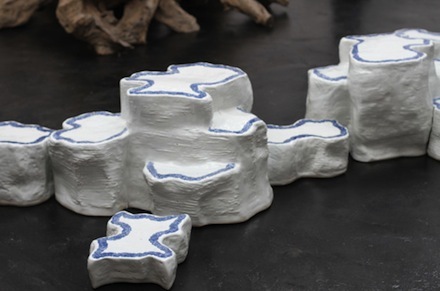 Ai used the same manufacturer for his porcelain rocks as he did for his “Sunflower Seeds” (2010), that were recently part of Tate Modern’s Unilever Series. To the viewer, they can seem like clouds that have been taken from the sky and placed on the ground, acting as walking stones in a garden. The tree sculptures, titled “Tree” (2011), have been produced by bolting together (using a traditional Chinese technique) fallen trees from the southern, mountainous regions of China. Together, the pieces combine to offer the viewer a garden-like atmosphere that the viewer is encouraged to explore. The exhibition has been somewhat overshadowed by politics due to Mr. Ai’s arrest. 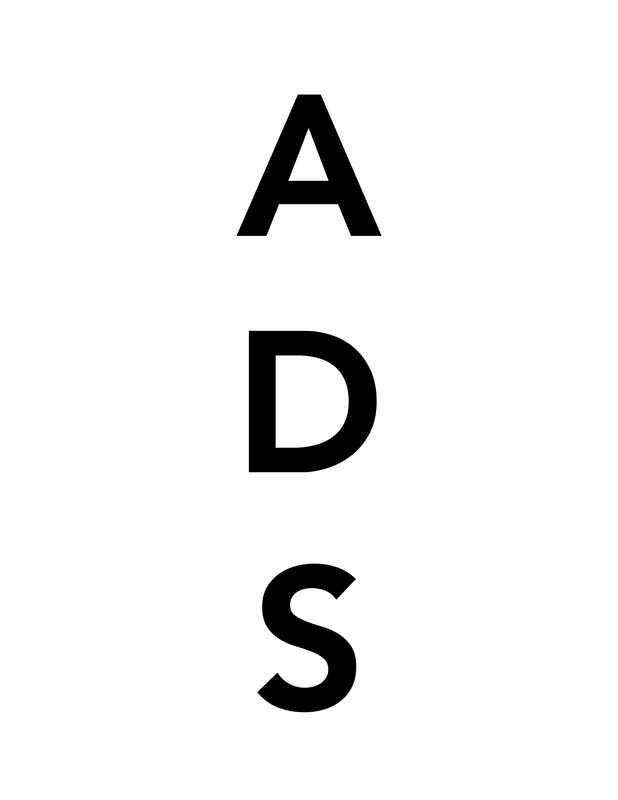 Ai Weiwei’s work has been described as politically engaged, and such engagement can be found in some of his controversial (or challenging) titles, like “So Sorry” (2010) – Haus der Kunst, Munich – which refers to the thousands of apologies recently from governments and companies for their harmful actions. It also no secret that Ai has supported those whom the Chinese government wishes to shun, and causes that the Chinese government wishes to stymie. However, Ai has repeatedly engaged in thoughtful artistic responses to such situations. In Germany, Ai was offered a professorship at Berlin’s Universitaet der Kunst, where the artist announced he would open a studio, after which he was arrested shortly thereafter. Ai Wei Wei’s arrest has prompted responses from all over the world, including “1001 Chairs for Ai Weiwei”, which was staged recently in NYC. Ai Weiwei’s work continues to command interest, which may be growing as more attention is given to those who demand his release. This entry was posted on Monday, May 23rd, 2011 at 5:32 pm	and is filed under Go See. You can follow any responses to this entry through the RSS 2.0 feed. You can leave a response, or trackback from your own site.